Subaru is experiencing such strong sales of the new Impreza, 2013 BRZ and XV Crosstrek, that they will need to invest $230 million into their U.S. Indiana plant and increase production by 30 percent. Subaru is also seeing strong sales of their newly-refreshed 2013 Outback and Legacy models which have increased 16 percent and 14 percent respectively. The new Impreza has experienced the biggest increase in sales with year-to-date sales increasing 184 percent over 2011. The newly released 2013 BRZ and new XV Crosstrek models added 2,587 incremental sales just for the month of November alone and sales have exceeded projections fourfold. Subaru announced record-breaking annual sales of 299,788 vehicles which represent a 28 percent increase over 2011 and just 222 vehicles short of achieving 300,000 sales for the first time in company history. This is a good problem for the Japanese automaker, and the U.S. production capacity alone won’t handle the strong global demand. The Nikkei Business Daily said, Subaru will need to raise its production capacity by 30,000 vehicles in the next two years. Subaru sold nearly 330,000 in the U.S. last year, and had to ship half of those from Japan. The U.S. plant in Indiana is the only other major plant in the world for Subaru other than the Gunma Prefecture facility in Japan. Fuji Heavy Industries briefly considered building a new factory in Mexico, but chose the cheaper option of expanding the existing U.S. facility. The new Subaru Impreza has received a complete makeover and buyers are responding to the new sedan in a big way. The 36 mpg Impreza is attracting new buyers faster than any other car in the Subaru lineup.The fourth generation Subaru Impreza is all-new for the 2012 model year and the complete makeover is attracting new buyers beyond the faithful loyalists. It gets new exterior styling, and a new stylish cabin that is attracting buyers. The new Impreza has achieved a significant jump in efficiency, value for dollar and appeal. It stayed at the same base price as the 2011 Impreza ($20,595), and features a new 2.0-liter boxer engine that produces similar power and performance as the outgoing 2.5, but fuel efficiency has been increased by a whopping 36 percent. 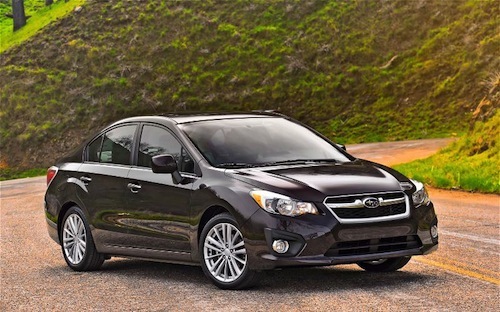 The 2012 Impreza 2.0i gets a stellar 36 mpg highway estimated fuel mileage rating with the CVT. That makes the Impreza the most fuel-efficient all-wheel-drive gasoline-fueled car on the planet. The all-new 2013 Subaru BRZ is one of the fastest selling cars in the U.S. and the new two-door rear-drive sport coupe only stays on dealer lots for 18 days before they are snatched up by buyers. “Days-to-turn” is the industry term that is used to gauge how popular a vehicle is. The BRZ is number nine on the top ten list of cars that stay on the lot for the shortest time. The BRZ has been popular around the globe and Subaru will need the expanded capacity in Indiana to keep up with the strong demand for the sports coupe. The Subaru brand is one of the fastest growing automakers in the world and is one to watch globally. The new Impreza has been wildly popular here in the U.S., and the 2013 BRZ and XV Crosstrek have been two good new additions this year that are selling well globally. I agree! I've recently purchased a subaru and couldn't be happier. The brand seems to have done a good job of expanding their market by delivering a fun to drive product with more of the expected amenities at a reasonable price. Not to mention the fantastic AWD. All that without upsetting their loyal niche followers (too much).